When can your dentist refuse to clean your teeth? When they’re trying to protect your health. Imagine this scenario: You’re at home, brushing your teeth, during your normal routine. Maybe you floss every day, maybe you don’t. When brushing, you notice your teeth seem to look a little longer. Maybe they seem farther apart, or have shifted a little. Maybe you’ve been chewing a lot of gum because your spouse tells you your breath is bad, even after brushing. Maybe you notice a little blood on your brush, on the floss, or in the sink. Maybe it’s more than a little. Maybe you feel some tenderness in your gums, or notice redness or swelling. You decide maybe it’s time to go in for a dental check-up. Your dentist or hygienist completes an exam, and reviews your x-rays. They probe around your gums, and there’s a good chance you feel like jumping out of the chair. Then they tell you something maybe you’ve never heard before, or maybe you heard it mentioned in previous visits but didn’t think it mattered. You have gum disease. Periodontitis, to be precise. Your dentist shows you the x-rays that reveal the progression of bone loss, and the buildup of calculus. They show you the size of the pockets between your gums and teeth, where the bacteria collect and cause chronic and systemic infection and inflammation immune response. They explain a common treatment procedure, called scaling and root planing. 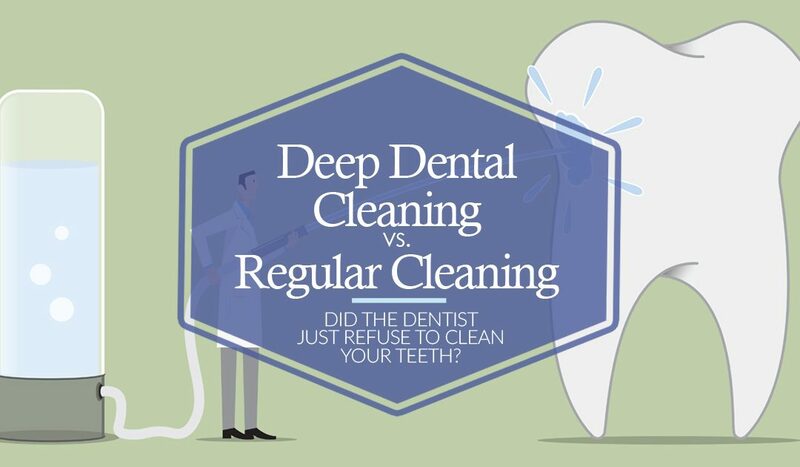 They explain the difference between a deep dental cleaning vs a regular cleaning. A deep cleaning is a treatment procedure that requires anesthesia and several follow up visits to make sure the infection has been cleared and your gums are healing. Okay, you say. I’ll come back and do that another day. Can you just clean my teeth so I can be on my way? Then your dentist says something you never thought you’d hear: I’m sorry, but no. When will your dentist refuse to clean your teeth? When they are trying to preserve your health. This isn’t going to sound nice, but we’re going to explain periodontitis as clearly as possible. Periodontitis is a chronic infection. Periodontitis is a disease. Bacteria have collected in the pockets and spaces below the gum line, around calculus (plaque) that has built up, usually due to infrequent flossing and inadequate oral hygiene. The bacteria secrete acids that dissolve the bone tissue that connect your teeth and jawbone. Left untreated, this chronic infection can and will progress. You will lose your teeth, and your jaw bone will continue to suffer bone loss that can’t be recovered or restored. We aren’t trying to scare you, we’re just stating the facts. Periodontitis is, quite literally, a symptom of your body destroying itself in a desperate attempt to fight off a chronic infection. This is not an upsell, this is a diagnosis and a sign of serious oral health issues in the near future. But nearly half of all adults in the United States over the age of 30 have some form of gum disease. Gum disease is a huge public health issue, with widespread impacts on health issues such as heart disease, COPD, other inflammatory diseases, diabetes, and pregnancy. So what should you do? Get mad, get a second opinion, but whatever you do, take action. Gum disease is treatable, curable, and most importantly, preventable. If you have dental insurance, chances are deep cleaning treatment is covered. If you are pregnant, seek treatment right away – gum disease is linked to preterm birth and babies with low birthweight. If you are having trouble making ends meet, Illinois has expanded healthcare coverage for adults including for pregnant people – check and see if you qualify. Make a plan. Ask us how we can help you. Patients who have had their periodontitis treated at our office have repeatedly told us how much better they feel overall after their treatment. Not just their mouth, but their whole body. It’s amazing how hard your body can work to fight off systemic infection, and what a toll it can take on your energy levels and overall health. Patients who have come back for follow up maintenance visits and regular cleanings post-treatment report that brushing and flossing is easier, and isn’t painful anymore. Their partners are happy to kiss them again because their chronic bad breath has gone away. Most importantly, our patients are able to keep their natural teeth for years to come.